This application connects directly to your camera, DVRs, NVR, or Video Server. It does not use any intermediate servers which can collect your information. All settings are stored on your iOS device. The Matrix View is normally the first screens you’ll see when you launch the application. The Detail View displays a single camera, allowing you to use pinch to zoom and finger gestures for digital zoom. This screen allows you to initiate pan, tilt, optical zoom, audio and other custom controls. The Matrix View focuses on displaying all cameras in a video wall fashion. Tap on a camera to enter the Detail View to control a camera. The number of columns in the matrix can be adjusted in the Application Settings screen. A – Click to bring up Options menu. B – Name of camera displayed above. C – Tap to enter Detail View of camera. Recall Group – Choose a group of cameras to recall. Auto Sequence – Automatically rotate groups periodically (set rate in App Settings). App Settings – Change application settings. Manage Cameras – Add/edit/delete/re-order cameras. Mass Action – Perform an action of ALL enabled cameras. For example: “Turn all light on/off” or “Turn all device motion detection on/off”. On entry to this screen, most controls are disabled. Once a connection has been established, controls which are supported by this camera will be enabled. Use 2 finger pinch to zoom gestures to perform digital zoom. When zoomed in, use 1 finger drag gestures to move within the zoomed image. Use 3 finger left/right swipe gestures to switch to prev/next enabled camera. To perform pan, tilt, and optical zoom open the PTZ Command Strip (F). A – Return to Matrix View. B – Show Options Menu. C – Take snapshot of current frame. F – Show PTZ Command Strip. A – Show/Hide PTZ Command Strip. B – This row of camera controls will vary from device to device (see Custom Controls below). 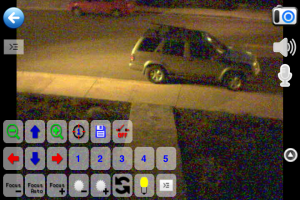 Prev Camera – Load previous camera. Next Camera – Load next camera. Auto Sequence – Automatically rotate cameras periodically (set rate in App Settings). Launch Cam URL – Launch browser interface for current camera. Commons tasks include adding, editing, deleting and re-ordering of cameras. Users are encouraged to Export their cameras (or Email to themselves) for backup. In addition, grouping of cameras can be used to manage large number of cameras and to minimize amount of resource usage in the mobile app. A – Click to enter standard iOS table edit mode where you can re-order camera order and delete cameras. Click again to exit edit mode. B – Name of camera. C – List of group(s) this camera is associated with. D – Shows whether this camera is enabled/disabled. Click to toggle status. E – Show Options Menu. F – Show Groups Menu. G – Add a new camera. App Settings – Setup application settings. Email Enabled Cams – Email enabled cameras to someone. 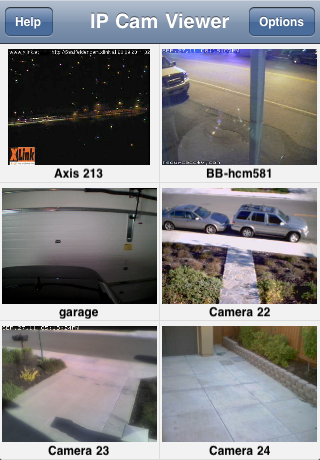 Long press on attachment (click on Android) and select to open with IP Cam Viewer to automatically import them. Export All Cams – Export all camera settings (regardless of enabled status) to application documents directory. Import Cameras – Import camera settings from a file in the application documents directory. Scan Camera – Use this tool to help you find compatible drivers for any camera. Clicking the Edit (A) button will put the table in edit mode. When the table is in edit mode (shown below), the standard iOS table edit mode controls allow you to re-order and delete cameras. A – Click Done to exit edit mode. B – Click the ‘-‘ button to delete camera. C – Drag this icon to re-order camera. Use the grouping functions to organize cameras into small groups. Recall Group – Choose a group of cameras to enable. Save as Group – Save all enabled cameras as a group. Delete Group – Delete a group. To edit an existing camera, open the Manage Cameras screen, click on a camera row, and select “Edit Camera”. Most network IP Cameras use some form of http/https protocol (unlike DVRs which tend to used custom network protocols). When an IP Camera type device is selected in the Add/Edit screen, appropriate input fields are displayed (shown below). A – Enter camera name. B – Click to select camera type. C – Hostname or IP address of camera. For example: mycam.dyndns.org, 232.45.24.19 (ipv4), 2001:0db8:85a3:0000:0000:8a2e:0370:7334 (ipv6). D – Select HTTP or HTTPS protocol. E – Enter port (leave blank for default port). F – Enter username for camera login. G – Enter password for camera login. H – Click for More Options (like invert pan/tilt). I – Click to test connection to camera. J – Preview after successful test (I). Port Overrides – Only some drivers have these optional settings. This happens when the driver actually asks the camera for it’s secondary ports like RTSP or MEDIA ports. Normally, you should port forward these camera ports so they are also accessible from the outside (WAN). For example, camera’s RTSP port at 554 (LAN side) should be port forwarded to 554 (WAN side). However, if for some reason the actual WAN port is different than that reported by the camera, then enter the actual WAN ports numbers here. This app will accept any IP address (including internal IPs like 192.x.x.x) and will use any available network (included private internal networks). However, IP addresses like 192.x.x.x are internal addresses and are not route-able over the Internet. See the following post to setup with a free Dynamic DNS service. Most network IP Cameras use some form of http/https protocol (unlike DVRs which tend to used custom network protocols). The following screen show the common input fields for IP Cameras. Most DVRs use a custom network protocol. The following screen show the common input fields for DVRs that use a custom protocol. See section above for HTTP/HTTPS devices. D – Enter port (leave blank for default port). E – Enter username for camera login. F – Enter password for camera login. G – Click for More Options (like invert pan/tilt). H – Enter channel number (sometimes this field is available for a camera that offers multiple streams). Tip: To view multiple channels, just add a camera for each channel. Use the same parameters except change the channel number in the “Ch.#” field. Remember to export your settings to sdcard for backup. If you have a camera’s jpeg or mjpeg feed, then you can use the Generic URL camera type to enter this URL. In Manage Cameras, click the “Add Camera” button and select the “Generic jpeg/mjpeg URL” option. 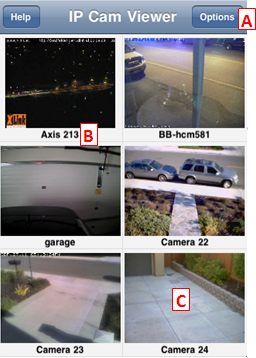 The fields are mostly the same as the Add IP Camera screen (section 2.1.1), except you enter the image path (i.e. “/path/image.jpg”) in the More Options screen (section 2.1.4). Clicking on the “More Options” button in Add/Edit Camera Settings brings up this screen. Here, you can change per camera options like image rotation, ptz inversion, and recording settings. A – Rotate image by 0, 90, 180, or 270 degrees clockwise. B – Mirror, or flip, image from left to right. C – For some cameras, this option will enable a higher resolution feed or an alternate image format or an alternate aspect ratio. D – For some cameras with interlaced video (where image is doubled), this option will remove the bottom half of the image. E – For cameras with 2-way audio, normally audio is half duplex, meaning you can either listen or talk but not both at the same time (this limitation is due to audio feedback loop issues). Enable this option to allow full duplex audio. F – Enable this option to turn on in-app motion detection in viewers (gallery/matrix) for this camera. When enabled, text status will turn orange color when motion is detected. Optional audio alert (see App Settings) will sound when repeated motion is detected. This option can lower refresh rate on slower processors. A – Invert pan direction (left/right). B – Invert tilt direction (up/down). C – Invert relay control. D – Normally, clicking “relay on” turns relay on and click “relay off” turns relay off. However, some devices, like garage doors, want a pulse (quick on then off) signal. Check this option and clicking the “relay on” button will quickly turn relay on and then off automatically. A/B – Normally, record mode will record 24×7. Select a start/end hour to only record during a hour range. C – Normally, record mode will record constantly. Enable this option to only record when repeated motion is detected (see Motion Detection). D – Enable this option to play an optional alert sound (see App Settings) when repeated motion is detected in record mode (see Motion Detection). E – Future feature: mobile notifications when repeated motion is detected in record mode. Changing the order of cameras is pretty simple. In the “Manage Cameras” screen, click on the “Edit” button. In this mode, simply drag the icons on the right side (B) up or down to change order. Press “Done” when finished (A). If you have lots of cameras, then you can group cameras by name to minimize resource usage in the mobile app. In both Matrix and Detail View, click the Options button and select “Recall Group” to change groups. – In Manage Cameras, put a “checkmark” next to the cameras you want in a group. – Click the Options button and select “Save as Group” and then give group a name. – In Manage Cameras, click the Options button and select “Recall Group” to restore a group. – Click the Options button and select “Save as Group” to overwrite existing group. – In Manage Cameras, click the Options button and select “Delete Group” to remove a group. Your camera settings are stored locally, on you device only, in an application database. If you uninstall the application, then your camera settings will be lost. Use the Import/Export function to backup and restore your camera settings to your sdcard. In Manage Cameras, click the Menu key and select the Export option. In Manage Cameras, click the Menu key and select the Import option. Note: Import will NOT overwrite your existing cameras with the same camera name. You can also use the Sharing function to backup and restore settings (by emailing cameras to yourself and then clicking on the attachment to import the cameras). Use the sharing function to send one or more camera settings to other people (or yourself) using email. In Manage Cameras, click on a camera row and select “Email Camera” to send this camera to a friend. In Manage Cameras, put a checkmark next to the cameras you want to shared. 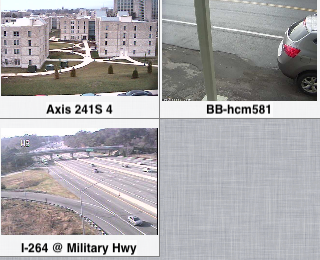 Click the Options button and select “Email Enabled Cams” to send all “checked” cameras to a friend. Your friend can long press on the attachment in the email to import the camera(s) automatically with IP Cam Viewer. If you have an unknown camera or DVR, you can use this feature to automatically find compatible drivers in the app. Go to Manage Cameras, click the Options button and select “Scan Camera”. Simply enter vital information like IP address or hostname (B), select device type (A), and press Test (H). After the test is complete, select a compatible camera type (I) in the results to add the camera. A – Specify the camera type to speed up the test. If you select Unknown, then all drivers will be tried so the test will take longer. B – Hostname or IP address of camera. C – Select protocol (HTTP, HTTPS or Binary). Select Binary for DVRs that use custom binary protocols. D – Enter port of the camera. E – Enter username of the camera login. F – Enter password of the camera login. H – Click to begin scan. I – Any compatible results found during the scan are listed here. Click on a row to add camera. If multiple compatible drivers are found, some may work better than others. For example, if pan/tilt does not work, then try another compatible driver. Application settings apply to the entire application. The Application Settings screen is accessible from the Gallery View and Matrix view by clicking the Menu key and selecting “Settings”. The app password can protect your cameras from people that borrowed the device to play a game. Once set, the application will ask you for this password before viewing. Clear both fields to delete the app password. A – Enter desired application password here. B – Verify desired application password here. C – Don’t ask again for 5 minutes. These settings affect the Matrix view and the Detail view. A – Set the maximum number of columns in Matrix View. B – Black background for matrix/detail views (default is white). C – Normally, using PTZ will display status messages. Check this option to disable PTZ status messages. D – Use this option to automatically dim the screen after a short period. Screen will un-dim if you interact with app and then auto re-dim after the timeout period. E – Normally, using PTZ will display status messages. Check this option to disable PTZ status messages. F – Disable touch gestures to pan/tilt/zoom camera. G – Use newer h.264 dvr code (default is on). H – Maybe required on older iOS devices with some bluetooth devices. I – Sound to play when connection to camera is lost. J – Sound to play when motion is detected repeatedly (may slow down refresh rate if on). These are network related settings. A – Normally, the app pretends to be Internet Explorer because most cameras have an Active-X user interface. However, some mobile carriers (i.e. SFR in France) block IE traffic so you can select a different User-Agent here. NOTE: some cameras are only accessible using IE user agent. B – Force close network connections because some cameras/routers will keep connections until a timeout period (default is on). Record Mode turns your spare iOS device into a solid state, battery backed, digital video recorder (DVR) for your standalone IP cameras. In this mode, the app will record all enabled cameras as fast as possible to sdcard (adjustable in the record settings). Disk space usage is automatically managed (older content is discarded to free space as needed). NOTE: Do NOT use this mode on your daily-use phone because it’ll drain your battery. To enter record mode, run application, click Options key and select “Enter Record Mode”. For each camera, you can change recording schedule and enable “record only when motion detected” in the Edit Camera -> More Options screen. This will greatly reduce the amount of disk space usage. System wide motion notification settings are configured in the Record Settings screen. Per camera motion settings are set in the Edit Camera -> More Options screen. Use the Playback screen to search for past footage and then convert clips to video file. For iOS version, record mode does NOT run in the background so you must leave the app running in Record Mode. Changing record settings while record mode is on will re-start record mode. A – When the free disk space reaches this threshold, the application will start deleting old recordings to free disk space. Default is 1GB which means the application will try to leave at least 1GB free on the disk. B – Delete old recordings now, until set free disk space (A) is achieved. C – Delete all old recording now. D – Set the recording frame rate for each IP camera. E – Set the recording frame rate for each public web camera like traffic cams. F – Set the quality of recordings (100% means very little compression, 60% means heavy compression). G – Enable or disable motion detection system wide (for all cameras). You can also control motion detection per camera in the Edit Camera -> More Options screen. H – Email address to receive motion notifications. I – Check when notification was last sent to email address, how many notifications are remaining, and how to add more notifications. * For SMS, use carrier’s free Email to SMS gateway, like 4085551212@txt.att.net (see http://hit-mob.com/email2sms.html). The record view is where you can start record mode, stop record, view record status, and view current frames in a matrix/grid while still in record mode. To enter record mode, run application, click Menu key and select “Enter Record Mode”. While record mode is on, launching the application will show this screen first. Click the Menu key in Record Mode to select this Playback screen. This screen allows you to search and playback previous recordings. Click the Options button for functions like exporting recordings to a video file. A – Camera to search. B – Date to search. C – Hour to search. D – Minute to search. E – Click to perform search of recorded data nearest to the given search criteria (fields A-D). The results are populated into fields F-H. Use buttons J-N to play back recordings starting from the search result. F – Last modified date of the frame displayed in H.
G – Filename of the frame displayed in H.
I – Switch camera with recorded data near current playback time. J – Rate of playback. “0” is stopped. Positive is forward playback. Negative is reverse playback. The larger the number, the faster the playback. K – Speed up reverse playback. L – Start reverse playback or slow down reverse playback. N – Start forward playback or slow down forward playback. O – Speed up forward playback. This screen allows you export recorded frames to a single video file. The video file can be replayed using Mac, iOS devices, Windows Media Player, RockPlayer Lite for Android and VLC media player for MAC/PC (media players buffer before displaying so short clips and beginning of clips may not display). From the Record Playback screen, find the desired starting position, click the Option key and select “Convert to File”. On this screen, select a duration and click “Export Now”. Depending on the amount of data, this process can take a very long time and create a very large file. Please be patient. 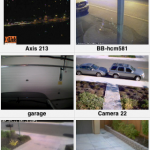 Regarding motion detection, there are 2 different offerings: 1) in-app motion detection for all cameras made available by my app and 2) in-camera motion detection available in some cameras. This section covers in-app motion detection which this app provides. For in-camera motion detection, which some cameras offer, see each camera’s native admin web interface to setup. 1. on initial startup (or after connection loss), it’ll take ~1 minute to learn before it starts working.